Good news for the 60,000 Brits heading to Le Mans this year is that Radio Le Mans will once again be broadcasting live and exclusive coverage from the world's greatest motor race. Haymarket Publications, which has held the rights for many years, stepped away from the service after last year's race, leaving fans concerned for the station's future. They need not have worried. Radio Show Limited has acquired the rights from the ACO and is keen to point out that regular listeners will feel right at home. John Hindhaugh, speaking on behalf of Radio Le Mans explains. "The ACO recognises the importance of Radio Le Mans to all of the fans, not just the Brits. They were keen to ensure the continuity of the station. To that end the core of the team, both in front and behind the microphones, are all back on board." It's not just the race that fans can listen to. Radio Le Mans will, subject to French Radio Authority approval, be broadcasting at the test day in early June. "The test day is attracting more fans who seem to enjoy the informal atmosphere and the increased access to the teams," said Hindhaugh. "We've never done an FM service at the track for the testing and the bonus is that if you can't make it down there you can still listen at home." In recent years the fans away from the track have become just as big a part of the station as the listeners trackside. The global audience will principally be served by live streaming audio at www.radiolemans.com although there are other ways to keep up with the Radio Le Mans team. Anyone with a satellite system can tune to live race coverage on SKY Channel 0157. Further afield, Speed TV in the US will be using the RLM feed to give its commentators a break (Hindhaugh doesn’t need one…). Aired overnight in the USA, the 'Insomniacs Coverage' of the morning hours at Le Mans has become a firm favourite with fans. Long-time Radio Le Mans supporter Audi UK is back, along with a new partner for the station, Aston Martin Cars. There's a new media partner too. 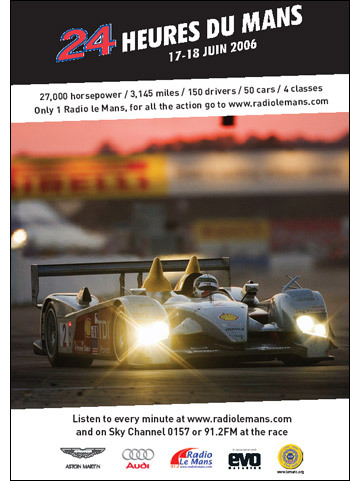 Dennis Publications, which numbers EVO, Auto Express, Test Drive and Maxim among its titles, makes its Radio Le Mans debut in 2006. dailysportscar.com will also be helping out - providing information and some expert analysis. "It's very gratifying to have such big names as partners for our first year and I hope our listeners realise how important every sponsor is," said Hindhaugh. "We are committed to securing the future of the service: however this is a big project and quite simply the station cannot exist without the support of the whole sportscar community. To some people it might seem like madness to take this on but what else could we do? Let the station disappear? Not likely! For one thing I wouldn't know what else to do for that week in June!"